Un costum de botez intr-o nota clasica, elegant si deosebit, emana o nota de distinctie. Costumul este compus din mai multe piese: frac, camasa, papion si pantaloni in aceiasi nuanta de bleumarin ca si fracul. Accesorii ce se pot comanda cu setul: joben si cizmulite. 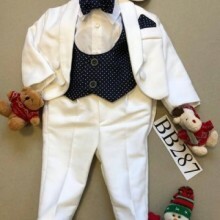 Please I need to ask if you deliver to Lebanon, because I want an outfit for my 1 year old baby baptism but he wears 2 years size and if you yes how many days need to be delivered. Thank you and looking forward to hear from you as soon as possible.